Cottage, 2 chambres à coucher, 3 salles de bain, (8 personnes) le mieux adapté pour 4 adultes max! Ce charmant cottage de plage a été entièrement reconstruit il y a six ans. Entrez par la porte avant et vous êtes sur le pont avec vue sur l'océan. Construit en bancs fournissent de nombreux sièges pour manger à l'extérieur ou tout simplement se détendre. Une cour magnifiquement paysagé est clôturé pour la sécurité des enfants. Le niveau de cette maison de terre dispose d'une grande salle avec des plafonds cathédrale, une belle nouvelle cuisine équipée avec cellier, et une suite parentale avec une superbe salle de bains avec une grande douche avec des accents de carreaux de verre. Le premier étage est la suite de maître privée avec vue sur l'océan et d'une salle de bain avec baignoire / douche. Le sous-sol est idéal pour les enfants ou suite âge adolescent. Il a doux, tapis neutre. Il ya un lit superposé et un futon double pour dormir. Un immense télé et un jeu wii sont fournis. Il ya une troisième salle de bain avec une douche hors de cette chambre. Une laveuse et une sécheuse sont également situés en bas. fournir des lits confortables king size. Le propriétaire fournira 2 passes invités pour l'aquarium de Monterey Bay sur demande. Le niveau bas est conçu spécialement pour les enfants. Il dispose d'un ensemble de lits superposés. un futon double et une télévision à écran géant avec un jeu Wii. Truly loved this sweet beach cottage. The view of the waves from the porch and bedrooms and falling asleep to the waves was awesome. Thank you! Thank you for taking the time to write this review! Happy New Year! Beautiful home, very close to the beach. Nice remodeled kitchen, comfortable common area. Enjoyed the board games, beach toys, and boogie boards available for use. Hoses in front and back of house make it easy to clean off after visiting the beach. Thank you for taking the time to write a review. It is most appreciated. The location is perfect. You can see the beach from the front porch and it's a nice quick walk. Restaurants and shops are within walking distance as well and the Boardwalk is just a quick Uber trip away. The house itself has a nice, warm feeling to it and the 3 levels, all with their own bathroom, is awesome. The kitchen could use a deep cleaning - some of the items in the pantry expired as far back as 2016, as an example - but the rest of the house was well cleaned and cared for and very comfortable. Much better than a hotel and Marie is great to work with. I would highly recommend. Especially if you have a dog. Dogs are allowed on Twin Lakes Beach on leash and it was nice to see that everyone was very good about following the leash rule. We will be back. Fantastic beach house located just a couple blocks from the beach. The house is very well cared for with lots of perks for families such as toys, sand toys, kids room and baby gates. The location allows easy walking to many restaurants and fun activities. Driving distance to every attraction in the area. The kitchen and living room make it easy to socialize with your group. Three bathrooms is really awesome too. Thanks for taking the time to write a review. It’s most appreciated! This home was so cute and in the perfect location. We enjoyed the patio on the front and all of the games that were provided. Beds were comfortable and house was clean and owner was a pleasure to work with. We will be back! Thank you so much! I so appreciate you taking the time to give us a great review. Please come back! Great home at the Harbor. This house is in the perfect location! 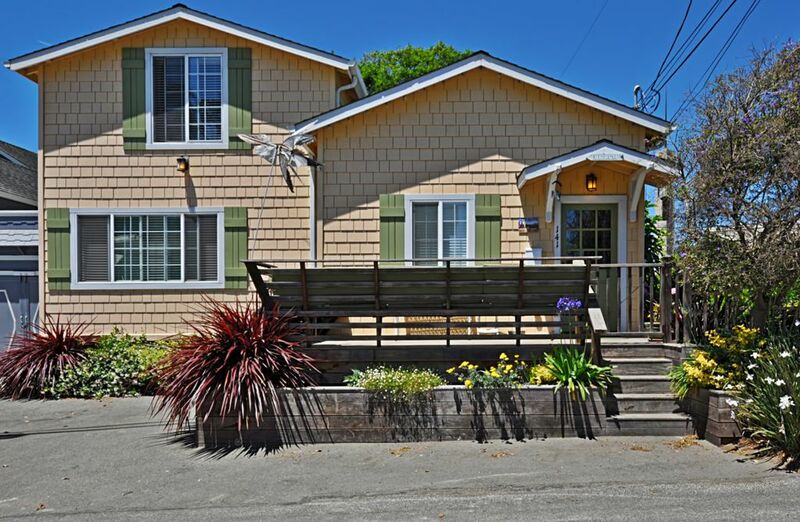 Everything is within walking distance, 1 block to the beach, 2 blocks to the harbor, short walk to Harbor Cafe, Seabright Brewery & Linda’s Seabreeze. Split 3 level home which is great if you’re traveling with kids as they have their own lower level. Wonderful deck off the front where you can sit with your cocktail in the evening and gaze at the beach at the end of the street. Owners very responsive. Thank you very much for the positive review. We love having you come as the house always is left in such great shape! Have fun in your next stay. L'aquarium Montery Bay est d'env. un 45 minutes en voiture de notre maison. Deux laissez-passer sont disponibles à la maison.